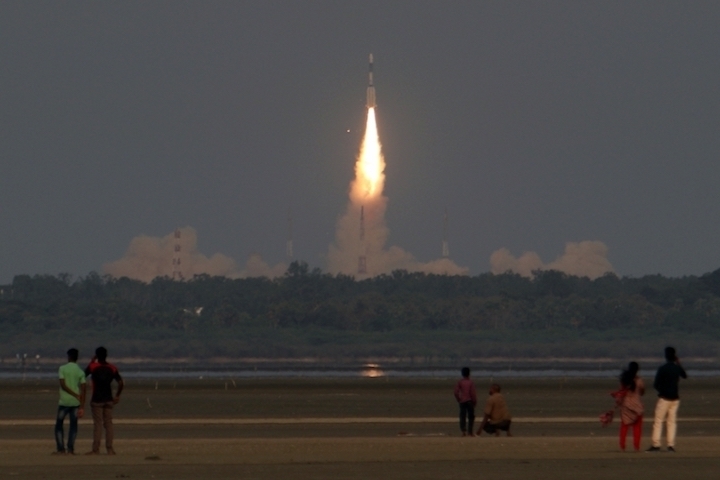 Raumfahrt - Mission Shakti caused ripples all the way to NASA. Astronomie - Mysterious Oumuamua interstellar object may have simple explanation after all New study aligns with previous research suggesting the object is a comet, not an alien spacecraft. Chennai: The launch of India’s second lunar mission ‘Chandrayaan-2’, slated for next month, has been postponed to October as the experts have suggested some tests, the Isro said on Friday. The experts had met recently and suggested the tests, following which the mission will now be launched in October, Indian Space Research Organisation (ISRO) chairman K.Sivan said. “Chandrayaan 2 will not be in April, it has been changed to October,” he told reporters at Chennai airport. Union Minister of State in the Prime Minister’s Office, in-charge of the Department of Space, Jitendra Singh had on 16 February last said the lunar mission under which the Isro will for the first time attempt to land a rover on the moon’s south pole, will be launched in April. 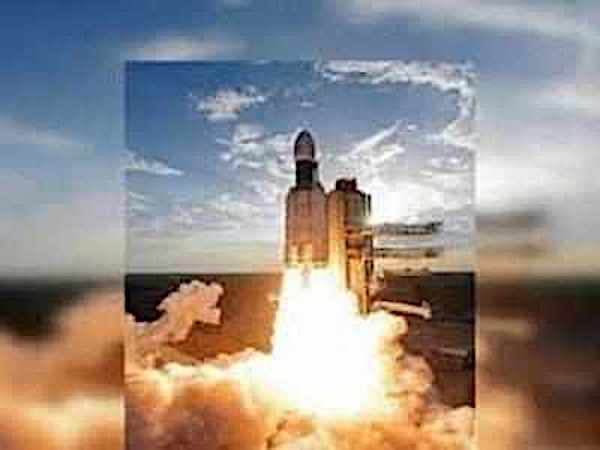 Sivan had earlier said the window to launch the Rs800 crore mission was between April and November 2018. While the “targeted date” was April, Isro would launch the mission in October or November, he had said. 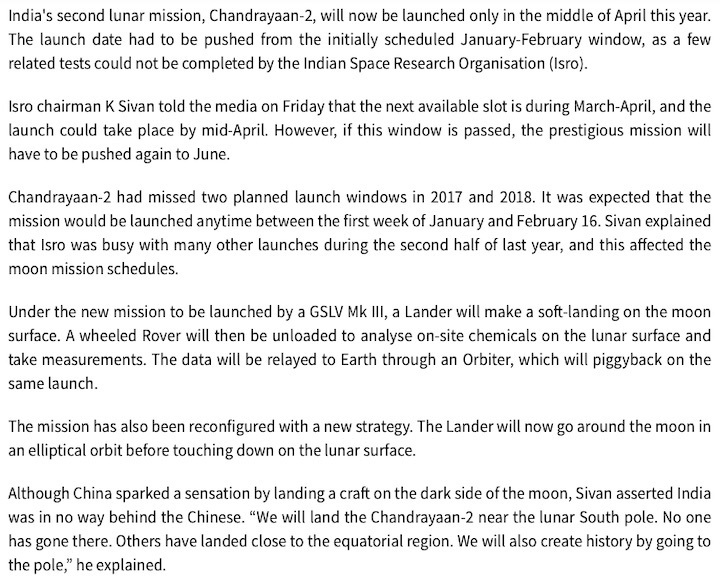 According to Isro, Chandrayaan-2 is a “totally indigenous mission comprising an orbiter, lander and rover”. The Chandrayaan-2 spacecraft weighing around 3,290 kg would orbit around the moon and perform the objectives of remote sensing the moon. “The payloads will collect scientific information on lunar topography, mineralogy, elemental abundance, lunar exosphere and signatures of hydroxyl and water-ice,” Isro said on its website about the lunar mission. Isro had launched its maiden lunar mission Chandrayaan-1 in 2008. Chennai: The launch of India’s second lunar mission ‘Chandrayaan-2’, slated for next month, has been postponed to October as the experts have suggested some tests, Isro chairman Dr K.Sivan said here Friday. He told reporters at the airport that experts had met recently and recommended some more tests before the mission launch, which led to the postponement. “Chandrayaan 2 will not be in April, it has been changed to October,” he said. Union minister of state in the Prime Minister’s Office, in-charge of the department of space Jitendra Singh had on said on February 16 that the lunar mission under which the ISRO will for the first time attempt to land a rover on the moon’s south pole, will be launched in April. Sivan had earlier said the window to launch the Rs 800 crore mission was between April and November 2018. While the “targeted date” was April, Isro would launch the mission in October or November, he had said. According to Isro, Chandrayaan-2 is a “totally indigenous mission comprising an orbiter, lander and rover”. The Chandrayaan-2 spacecraft weighing around 3,290 kg would orbit around the moon and perform the objectives of remote sensing the moon. “The payloads will collect scientific information on lunar topography, mineralogy, elemental abundance, lunar exosphere and signatures of hydroxyl and water-ice,” Isro said on its website about the lunar mission. Isro had launched its maiden lunar mission Chandrayaan-1 in 2008. On the second visit to moon, India hopes to soft land near the south pole of moon and explore the lunar surface with a tiny six-wheeled moon rover and conduct experiments. India's ambitious mission to the moon piggybacking a lunar rover is postponed once again with a possible lift-off only in 2019. The Chandrayan-2 mission was earlier slated for October 2018 and is now rescheduled because of technical glitches. 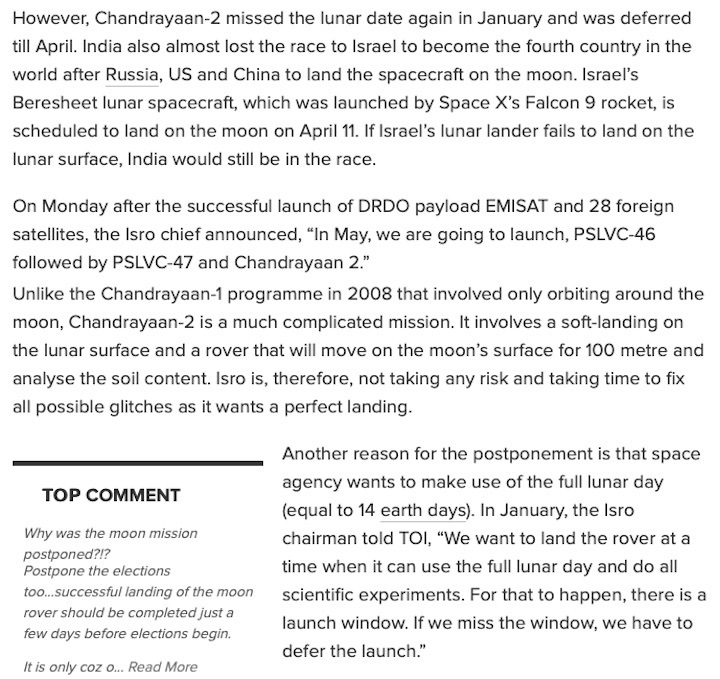 This delay may now give Israel an opportunity to edge past India with its moon landing. Israel through a non-profit company called SpaceIL seeks to launch its moon probe, Sparrow, in December this year. The Israel mission will be using the American Falcon-9 rocket hoping to soft land on the moon on February 13, 2019. It is now a wait and watch game as to who grabs the fourth spot of soft landing on the moon -- India or Israel. Considered to be good friends, Prime Minister Narendra Modi and Prime Minister of Israel Benjamin Netanyahu, both known space buffs, will be urging the nations space agencies to edge past the other. On the second visit to moon, India hopes to soft land near the south pole of moon and explore the lunar surface with a tiny six-wheeled moon rover and conduct experiments. Technical glitches are causing delays at ISRO. 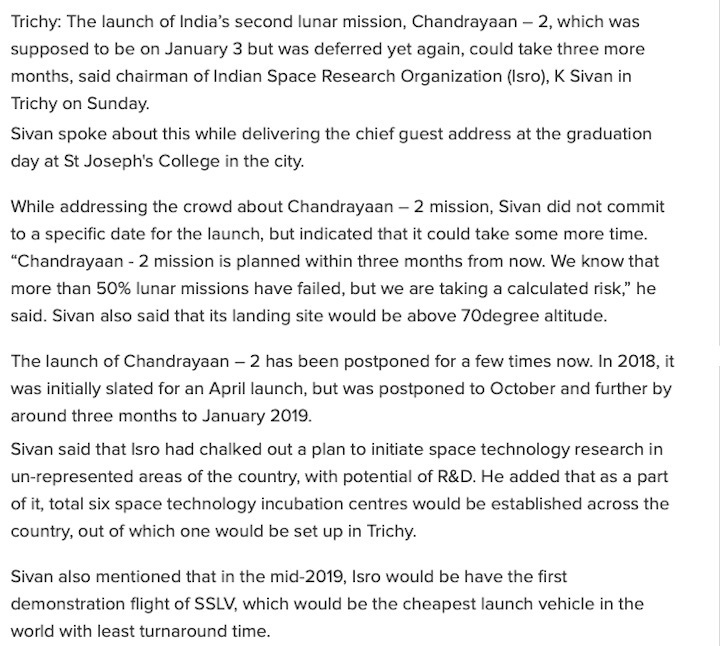 Dr M Annadurai, Director of U R Rao Satellite Centre confirmed to NDTV that the launch date for Chandryaan-2 "is slipping to 2019" from the initially planned launch in October this year. Dr Annadurai said that India's moon mission now aims to land in February and the rocket launch will take place in January next year. Moreover, since the weight of the Chandrayaan-2 satellite has increased, Dr Annadurai said that now instead of GSLV MK-II, GSLV MK-III will be used. 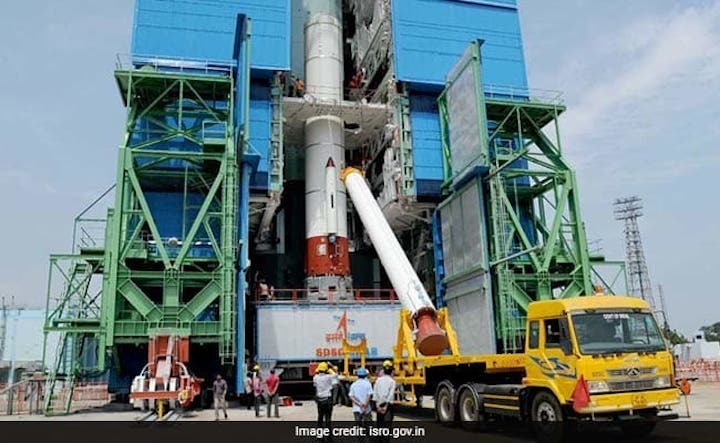 Geo-synchronous Satellite Launch Vehicle MK-III (GSLV MK-III), also called the 'The Bahubali', is India's heaviest rocket that weighs nearly 640 tons and will be used to hoist the Chandrayaan-2 satellite from India's rocket port at Sriharikota. "The orbiter is fully ready and tested and as far as lander is concerned, it is undergoing tests. It needs four plus one, five thrusters of 800 Newtons which will be used to make it gradually come down and land on the moon surface. These tests are going on in a simulated moon environment," Dr Annadurai told NDTV. He added, "The rover is also being tested in a simulated lunar terrain environment. All things put together we will be able to manage end of this year to roll out all the three combinations from the ISRO Satellite Center in Bengaluru to Sriharikota." Through Chandrayaan-2 India is hoping to assert its independent capability of not only orbiting a satellite but also show its technical prowess of soft landing and then sending a rover on the lunar surface. The rover will leave a permanent imprint of India's flag and emblem on moon's surface. India first sent a spacecraft to the moon in 2008 through Chandrayaan-1 which was essentially an orbiter. But it did crash land on the moon surface through the Moon Impact Probe (MIP) on November 14, 2008, through what is called a hard landing on the lunar surface. ISRO says the MIP would have broken into pieces on crash landing. Till date Russia, the US and China have successfully soft landed on the lunar surface and now India and Israel are racing against each other take the fourth spot in the elite club. The then Soviet Union soft landed on the moon on February 3, 1966 through its Luna-9 spacecraft. It was followed by the United States through its Surveyor-1 spacecraft that soft landed on the moon on June 2, 1966. The next country to independently soft land on the moon was China on December 14, 2013 when its spacecraft Chang'e-3 soft landed a rover called Yutu or 'Jade Rabbit' on the lunar surface. Of course, in between 12 American astronauts visited the lunar surface starting with Neil Armstrong in 1969. As of now India has no plans of sending astronauts or vyomnauts to the moon, but ISRO does harbour ambitions of sending Indians into a low earth orbit some time soon. NEW DELHI: The lander on the Chandrayaan-2 mission, to be be launched early next year, will be named ‘Vikram’ after Vikram Sarabhai, father of the Indian space programme. Isro has got clearance from the Space Commission, its chairman K Sivan said on Sunday. Further, taking inspiration from Nasa, Isro will soon open its spaceport in Sriharikota to the public, who will be able to see live launches from inside the facility. “We are also planning space galleries and museums and even have an exclusive magazine that we wish to produce,” Sivan said. This mission involves a lander for a soft landing on the lunar surface, and unloading a rover to take measurements from the Moon, while the orbiter will go around the Earth’s satellite. Chandrayaan-2 would be launched with the help of GLSV Mark III launcher. Chandrayaan-2, ISRO’s “most complex mission”, is scheduled to be launched in January next year after experts suggested changes to avert failure, its chief K Sivan said on Tuesday. Addressing a press conference, he said the project was reviewed by eminent experts who suggested some changes in entering the orbit and in landing the rover. These were also the steps taken by China while executing its moon mission programme, he said. “It is the most complex mission ISRO has ever taken. To ensure that it becomes a success in the first attempt they (experts) have suggested some changes,” he said. The changes suggested has also led to increase in the weight of the mission and it would now be launched with the help of GLSV Mark III launcher. The window period to launch the mission starts on January 3, 2019 and ends on February 16, 2019. However, Sivan said the ISRO intends to launch the project by January next year. “The Mission will have an orbiter weighing 2,379kg, lander named Vikram weighing 1,471kg and a rover weighing 27kg,” he said. The lander will also land near the south pole, which has remained unexplored, Sivan said. The ISRO also aims to launch 19 missions up to March 2019. These missions include launch of four satellites to accomplish the Digital India programme by providing higher bandwidth for connectivity. AFTER A SERIES of delays and setbacks, the countdown has begun. On January 3, 2019, Chandrayaan-2 should blast off from Sriharikota and fly towards the moon, a 40-day-long flight. India has chosen an unmapped region of the moon, its south pole, to land. The choice is studied and deliberate. Earlier moon missions, including the human landings, have all been in the northern hemisphere; the south has remained unexplored. “It is also an interesting area. It receives low sunlight, so there are better chances of finding water here. The region, however, gets more hours of sunlight, thereby giving more time for the probes to carry out their experiments,” explained ISRO chairperson K. Sivan. For these studies, Chandrayaan-2 will have three parts: the orbiter, the lander and the rover. As Chandrayaan-2 enters the lunar orbit, it will separate out into two parts, the orbiter and the lander. The orbiter is packed with eight sophisticated instruments, including a three-dimensional camera and an X-ray spectrometer. These instruments will pick up X-ray radiations—signatures of surface elements and minerals—and even map the radio anatomy of the moon’s exosphere, thus providing a clearer idea not just about how the moon looks like, but also what it feels like. Meanwhile, the lander will aim for a soft landing somewhere in the polar region. And then will emerge the wheeled rover, which will take a stroll on the moon’s surface, its spectrometer and spectroscope tasting the surface and getting an idea of the elemental composition. The lander will make itself comfortable in one spot, its four instruments snapping into work mode and analysing the region’s seismicity, plasma movements and electron count in the air. The entire mission is 100 per cent desi. Some of it by intent, the rest by circumstance. 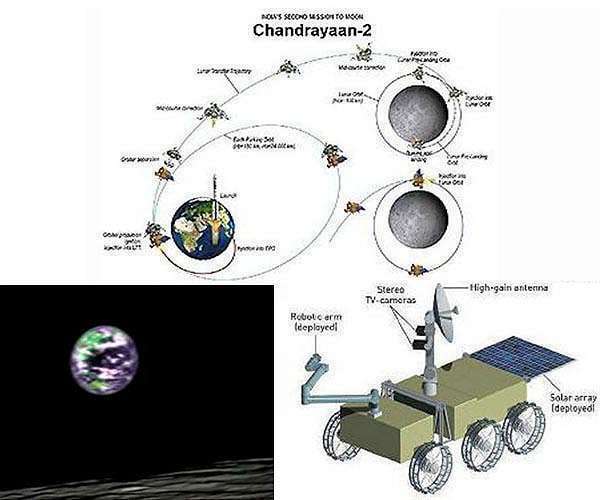 Chandrayaan-2, was conceived way back in November 2007, even before the first moon probe had been launched. It was initially planned as a joint mission with Russia. India would make the rover and orbiter; Russia, the lander. But then, in November 2011, Russia’s space agency Roscosmos suffered such a setback that it had to halt all ongoing projects and go for an intensive review. Its Fobos Grunt mission, which was headed to a Martian moon, failed. The rocket burnt up in an inner earth orbit, and the satellite fell uncontrolled into the Pacific Ocean the following January. 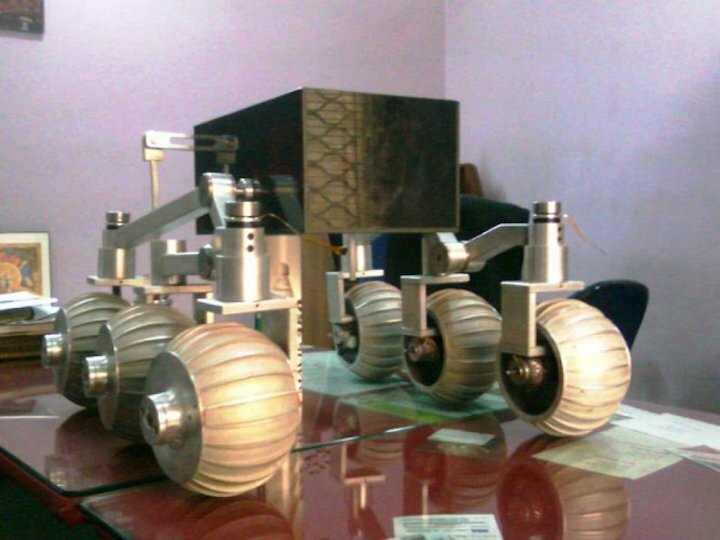 Fobos Grunt, too, had a lander that was meant to pick up soil samples, similar to the one planned for Chandrayaan-2. India waited, but Russia finally said it could not provide the lander before 2015. India then made an in-house lander. Perhaps, that is why the lander is the only part of the project to have its own name, Vikram. The added R & D took time. And, over time, the scale of the mission itself was expanded. So, the launch date shifted from April 2018 to October. However, just before the countdown could begin, it was once again reviewed by a panel of eminent experts, who were not happy with the dusty landing. They felt a mission as complex as this should be a success and a little delay was fine if it ensured a cleaner landing. The better the landing, the better will be the functioning of the instruments on board. As reconfiguring of Vikram increased the payload by 600kg to 3,890kg, the launch vehicle, the GSLV Mk II, could no longer carry it. So ISRO had to marshal its Bahubali—the 4-tonne GSLV Mk III—for the mission. The satellite is now ready for its rendezvous with the moon. ISRO says that the launch window is till February 2019, so even if there is a minor delay due to weather or some other eventuality, the space agency should still be able to send the probe by February. Akey payload, which will part of the India’s second mission to the moon, Chandrayaan-2 that the Indian Space Research Organisation (ISRO) plans to launch in early January next year is enroute to Bengaluru. The Ka Band Radar Altimeter and HDA Processor of the Chandrayaan-2’s Lander will arrive in Bengaluru soon for integration with the spacecraft. “Chandrayaan-2 Lander Ka Band Radar Altimeter and HDA Processor was flagged Space Applications Centre (SAC) from SAC, Ahmedabad to U R Rao Satellite Centre, Bengaluru. Ka Band Radar Altimeter and HDA Processor is one of the key payloads of Chandryaan-2,” said ISRO. The UR Rao Satellite Centre is the lead centre of Isro for the design, development, fabrication and testing of all Indian made satellites. The Chandrayaan-2 mission involves after reaching the 100 km lunar orbit, the Lander-Vikram which is named after Vikram Sarabhai the father of Indian space programme housing the Rover will separate from the Orbiter. After a controlled descent, the Lander will soft land on the lunar surface at a specified site and deploy a Rover. The mission will carry a six-wheeled Rover that will move around the landing site in semi-autonomous mode as decided by the ground commands. The instruments on the rover will observe the lunar surface and send back data, which will be useful for analysis of the lunar soil. The Rs 800-crore Chandrayaan-2 weighing around 3,290 kg and would orbit around the moon and perform the objectives of remote sensing the moon. The payloads will collect scientific information on lunar topography, mineralogy, elemental abundance, lunar exosphere and signatures of hydroxyl and water-ice. The test proved the navigation capability of Vikram, the lander aboard Chandrayaan 2, said K Sivan, chairman of ISRO. The Indian Space Research Organisation (ISRO) successfully conducted crucial tests to ensure smooth and precise landing of Vikram, the lander aboard Chandrayaan 2 on Thursday. The aim of the Lander Actuator Performance Test (LAPT) was to assess the performance of the navigational system onboard the lander for steering the module horizontally and vertically to reach a predefined target. “The test proved the navigation capability of Vikram. The test module had all the actual navigational system that will be sent to the moon on board. Only the mass had been reduced to 1/6th the actual lander...,” said K Sivan, chairman of ISRO. "Scaled-down version of Chandrayaan-2 Lander Vikram completed, critical Lander Actuator Performance Test (LAPT) to demonstrate capabilities of navigation, guidance and control system," ISRO said in a release. ISRO intends to launch Chandrayaan-2 sometime in January next year. Indian Space Research Organisation said on Friday, that it has successfully conducted a scaled-down test for the soft and safe landing of its Chandrayaan-2 lander for India's second Moon mission. The moon lander, Vikram, named after the father of Indian space programme Vikram Sarabhai, will carry out various tests on the moon surface. "Scaled-down version of Chandrayaan-2 Lander Vikram completed, critical Lander Actuator Performance Test (LAPT) to demonstrate capabilities of navigation, guidance and control system of Vikram for a safe, soft and precise landing on the Moon," ISRO said in a release. The LAPT test was meant for compensating the effect of earth's gravity as compared to the moon's and to match the thrust generation of sea level liquid engines as compared to flight engines, which will operate in vacuum environment, it said. 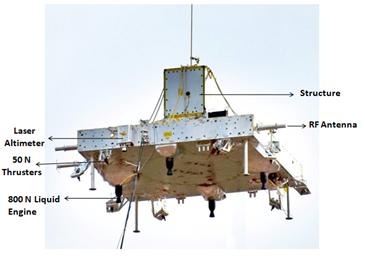 The module was tied to a crane hook for conducting the test at a special test facility at ISRO Propulsion Complex in Mahendragiri in Tamil Nadu. It was the third and final test to demonstrate retargeting in a parabolic tragectory. horizontally as well as vertically down to a pre-defined target, the release said. "With this, all the tests have been completed successfully. This is a major milestone accomplished in Chandrayaan-2 Lander," it said. ISRO intends to launch Chandrayaan-2 sometime in January next year. The Mission will have an orbiter, lander and a rover. India's first lunar mission Chandrayaan 1 was successfully launched in October 2008. Scientists have found frozen water deposits in the darkest and coldest parts of the Moon's polar regions using data from the Chandrayaan-1 spacecraft, US space agency NASA said in August. The Lander Actuator Performance Test (LAPT) is one of the crucial tests required to be demonstrated for a successful soft and safe landing of Vikram (Chandrayaan-2 Lander). To carry out this test, an LAPT module which is a scaled down version of Vikram with all the required hardware was realised for testing in Earth environment. The reason for the scaling down is to compensate the effect of Earth’s gravity as compared to Moon’s gravity and to match the thrust generation of sea level Liquid Engines as compared to flight engines which will operate in vacuum environment. The module was tethered to a crane hook for conducting the test. To carry out this test, a special test facility was erected at ISRO Propulsion Complex, Mahendragiri. The objective of the test was to assess the closed loop integrated performance of Sensors, Actuators and Navigation, Guidance & Control (NGC) and guidance algorithms below 100 m height. Three tests have been conceived as part of LAPT Phase-2 activities to demonstrate these objectives. First test was conducted to demonstrate Vertical Descent while second Test was conducted to demonstrate Hovering. The third and final test was successfully conducted to demonstrate re-targeting in a Parabolic Trajectory, on 25th Oct 2018 at ISRO Propulsion Complex, Mahendragiri. This test demonstrated the capability of the NGC system of Vikram to meet the mission requirement of safe, soft and precise landing on the lunar surface by steering the module horizontally as well as vertically down to a pre-defined target. With this, all the tests have been completed successfully. This is a major milestone accomplished in Chandrayaan-2 Lander. 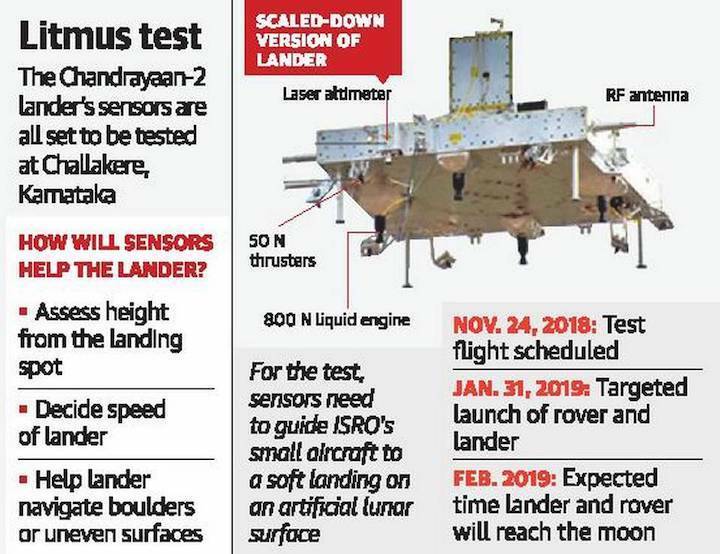 The Chandrayaan-2 lunar lander’s sensors are set to undergo a crucial test in the next few days as the mission races towards a planned take-off in around two months. 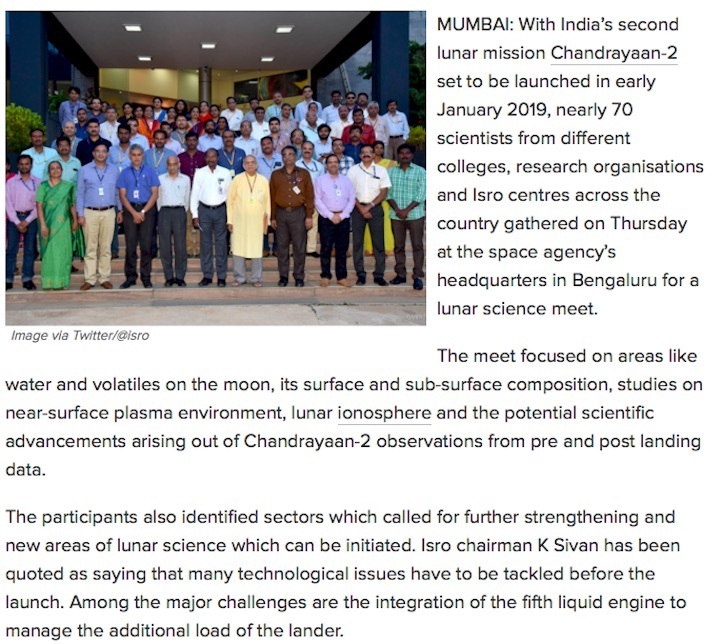 The Indian Space Research Organisation (ISRO) plans to fly the sensors on an aircraft over its artificial lunar site at Challakere to see how they will function and guide the Chandrayaan-2 landing craft when it starts descending on the lunar terrain. The test flight is slated tentatively for November 24. The orbiter carrying the lander and a rover is scheduled to be sent to the Moon from Sriharikota on January 31 and expected to reach there sometime in February 2019. The test on ground, called the Lander Sensor Performance Test or LSPT, will be conducted at ISRO's new R&D campus in Chitradurga district, about 200 km from here, ISRO Chairman K. Sivan said. The highly autonomous or pre-programmed mission uses a large number of sensors. Among them are those that help the lander to precisely assess its height from the landing spot; decide its speed and help it to steer clear of any boulders or uneven surface. The lander is being developed and tested by the U.R. Rao Satellite Centre in Bengaluru. For the test, a prototype module carrying the sensors will be flown on one of ISRO's two small aircraft. As the plane descends from around 7 km to about 1 km over the artifical terrain, the sensors must show how they will guide the soft landing of the lunar craft at the right spot, speed and position. About two years back, ISRO had started readying a part of the Challakere site to resemble lunar craters and had conducted a few preliminary sensor tests. Features of the lander have since been modified and the upcoming tests will also validate the new design. “The development and testing of the orbiter are over. Lander-related activities are going on. We will then add the rover also [to tests.] Until the mission is launched, we would be testing all systems continuously after every integration,” said Dr. Sivan. This is the second time the space agency deferred the mission launch after it was put off first time in October for unspecified reasons. India's second Moon mission Chandrayaan-2 scheduled to be launched today with a lander and rover has been delayed again, officials said today. "The next launch date of Chandrayaan-2 has not been confirmed yet," a spokesman of the state-run Indian Space Research Organisation (ISRO) said. ISRO Chairman K Sivan had said earlier that they planned to launch Chandrayaan-2 on January 3, but the reason for the delay has not been made public yet. "The window to launch the Moon mission for landing on its surface is, however, open till March," Mr Sivan had said. The Rs. 800-crore Chandrayaan-2 mission comes a decade after the maiden mission Chandrayaan-1 was launched on October 22, 2008 from the country's only spaceport at Sriharikota in Andhra Pradesh. The 3,890-kg Chandrayaan-2 spacecraft, to be launched onboard the Geosynchronous Satellite Launch Vehicle (GSLV) Mk-3, will orbit around the Moon to study its conditions and collect data of its topography, mineralogy and exosphere. After reaching the 100-km lunar orbit, lander with rover will separate from the spacecraft and gradually descend to soft land on the Moon at a designated spot. The rover's instruments will observe and study the lunar surface. The lander has been named "Vikram" as a tribute to the pioneer of India's space programme and former ISRO chairman (1963-71) Vikram Sarabhai. When Chandrayaan-2's rover lands on the Moon, India will be the fourth country in the world to achieve the feat after China in December 2013, the US in 1969 and then Soviet Union in 1959. The Indian Space Research Organisation (ISRO) is likely to launch Chandrayaan-2, the country’s second mission to the Moon, next month, sources in the space agency said on Thursday. “We are all trying hard. Definitely, it should be possible to launch the mission in February,” a senior ISRO official told PTI. It is expected by the middle of next month but no date has been finalised, the sources said. “There is no impediment. It’s on track,” the official said. Chandrayaan-2, a totally indigenous venture, comprises an orbiter, a lander and a rover. After a controlled descent, the lander would soft-land on the lunar surface at a specified site and deploy a rover, according to the ISRO. The six-wheeled rover will move around the landing site on the lunar surface in a semi-autonomous mode as decided by the ground commands. The instruments on the rover will observe the lunar surface and send back data, which will be useful for analysis of the lunar soil. The 3,290-kg Chandrayaan-2 will orbit the Moon and perform the objectives of remote sensing it. The payloads will collect scientific information on lunar topography, mineralogy, elemental abundance, lunar exosphere and signatures of hydroxyl and water-ice, the space agency said. Chandrayaan-1 was India’s first lunar probe. It was launched by the ISRO in October 2008 and operated till August 2009. Trichy: The launch of India’s second lunar mission, Chandray ..
Isro chairman K Sivan told the media on Friday that the next available slot is during March-April, and the launch could take place by mid-April. However, if this window is passed, the prestigious mission will have to be pushed again to June.